My First Chocca Biscuit Cake!! If you know me as I know you think you might know me by now… ;o) … I do love to make or bake pressies for people (if I have the time), rather than just buy something from the shop. 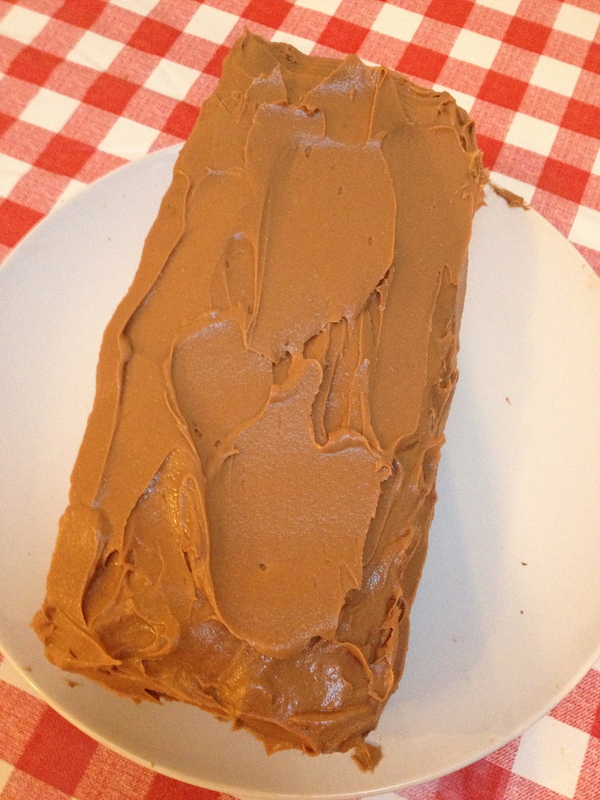 So when my good pal Charlie O’Donoghue was turning 13… that was all the excuse I needed to get baking! I’m not a flashy, fancy cake decorator or anything. I like quick recipes: anything that can be done in under 20 minutes AND whose ingredients can all be lobbed into the one bowl is my friend. 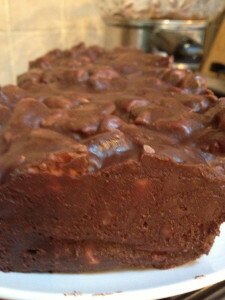 On this basis, it is altogether extraordinary that I made my first chocolate biscuit cake two weeks ago! Not only does it REQUIRE that you shove all the ingredients into one bowl – you don’t even have to bake it afterwards. That’s right, it just gets chucked into the fridge until it’s done. Genius. 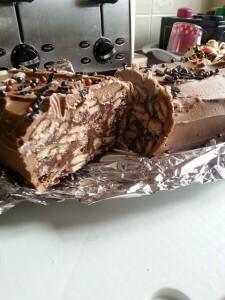 I just like thinking about a thing, and then Googling a thing – so I Googled ‘Best Chocolate Biscuit Cake Recipe’ and was directed to an amazing site called Cake In The Country. The entire theme of the site has a great wit about it, so I look forward to the email updates I’ve subscribed for! 1 x small tin of condensed milk – mixed in with everything else at the very end before pouring into a loaf tin that I lined with greaseproof paper. Pat it all down with the back of a spoon and leave in the fridge for a couple of hours. I left mine overnight. For the icing, I got the mixer out and beat 2 sticks of butter and a tablespoon of milk together. Covered in delish chocolate buttercream icing. While it was doing it’s thing, I melted a packet of Dr. Oetker’s chocolate chips in a bowl in the microwave (30 seconds, stir, 30 seconds, stir!) which I then added to the butter and milk mixture after it had cooled a little. Next was a teaspoon of vanilla into the mixer for 3 minutes and finally I sifted about a cup and a half of icing sugar in until the consistency was gloopy enough to spread on the cake! The finished chocolate biscuit cake for my main man Charlie! This entry was posted in Food & Drink and tagged Baking, Food, Raising Ireland, sharyn hayden on November 2, 2013 by Sharyn Hayden.